Raptivity Linker, a tool useful to quickly connect various Raptivity interactions, was launched recently. It lets Raptivity users create a logical and meaningful sequence of interactions quickly without depending on any other third party tool. From the time of Linker’s beta launch, Raptivity customers were involved in sharing feedback for its enhancements and various use cases where it could be used. Based on the feedback, Raptivity Linker’s launch version boasts of a plethora of exciting features. The new Raptivity Linker now comes with features like SCORM tracking, blank slides, and multiple slide layouts with options for text, images and videos alike. The much demanded support for YouTube and Vimeo videos is also there! Considering the ease of use of this tool and the entire feature set, it can very well serve as a wholesome solution to create short learning experiences. These learning experiences can be used as standalone modules complete in themselves, or as short snippets that form part of bigger courses. What started off as a tool to string Raptivity interactions has evolved into a solution for creating ‘Bite Sized’ or ‘Just-In-Time’ Learning modules. 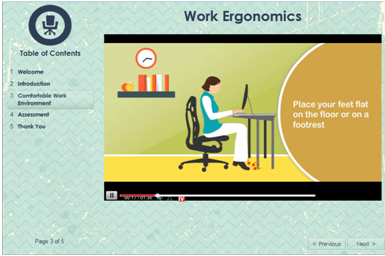 Here is a short learning module on 'Work Ergonomics' created using Raptivity Linker. Raptivity Linker is available for free download to all Raptivity users. A free trial is also available for non Raptivity users. Click here to download your copy. 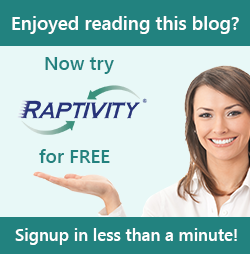 Raptivity users can write to support@raptivity.com and get the download details. To know more about Raptivity Linker, visit www.raptivity.com/raptivity-linker.html. To view some samples created using Raptivity Linker, click here. Looking forward to feedback and suggestions from all of you on the new Raptivity Linker.